This wonderful middle-grade novel abounds in contrasts -- rich and poor, light and dark, realistic and fantastic – and is utterly gripping from page one. Set in Victorian London, it centers on three children. One is extravagantly privileged but has a morbid back story; two are impoverished orphans in the thrall of a puppeteer who exploits their youth and talents to ply his trade. Dickensian in tone but with supernatural elements, this beautifully written, heart-stoppingly suspenseful book is richly rewarding on many levels. Laura Amy Schlitz is the author of the Newbery Medal–winning Good Masters! Sweet Ladies! Voices from a Medieval Village, illustrated by Robert Byrd; A Drowned Maiden’s Hair: A Melodrama; The Night Fairy, illustrated by Angela Barrett; and other books for children. She lives in Maryland. Filled with lush language and delightful sensory details like the savored warmth of a velvet cloak, this marvelous story will keep readers absorbed throughout. While the intricate storytelling, captivating characters and evocative setting owe a great deal to Dickens, the book also feels very much in the tradition of such grand 20th-century writers as Joan Aiken and Elizabeth Goudge. Filled with heart-pounding and heart-rending moments, this delicious, glorious novel is the work of a master of children’s literature. Newbery Medalist Schlitz delivers many pleasures—fully dimensional children, period details so ripe one can nearly smell them, and droll humor that leavens a few scenes of true horror. A highly original tale about children caught in a harrowing world of magic and misdeeds. Middle-schoolers not quite ready for Erin Morgenstern’s The Night Circus can revel in this lusciously atmospheric title of rival magicians and the children caught in their crossfire. Two orphans, a witch and a girl who laughs at death: Each shares the lens of protagonist in Newbery-winner Schlitz’s fully satisfying gothic novel...Schlitz’s prose is perfect in every stitch, and readers will savor each word. Victorian London could be a magical place: horse-drawn carriages, puppet shows, elaborate upper-class houses. Of course it could also be miserable: fog, filthy streets, shabby hovels where too many people live in too few rooms. Schlitz conjures both the magic and the mundane here. . . .Schlitz uses such evocative language that readers will practically smell dirty London and then be relieved by the crisp, cold air in the countryside around the witch’s crumbling mansion. The characters are recognizable tropes: the witch is rotting from the inside out; the orphans may be dirty and ill-bred, but they have spirit and pluck; the little rich girl is actually sad and lonely; the skinny puppeteer and the overly dramatic landlady are recognizably Dickensian. Yet, they are so well drawn that they are never caricatures, but people whom readers will cheer for, be terrified of, or grow to like. The plot is rich with supernatural and incredibly suspenseful elements. Fans of mystery, magic, and historical fiction will all relish this novel. In this not-quite-parody novel Schlitz takes the conventions of melodrama and fleshes them out with toothsome scene setting and surprising, original character details. The two heroes are fine foils for each other, the Victorian-good Lizzie Rose versus the street-pragmatic Parsefall. Grisini, with his back story in Venice, is pure moustache-twirling evil, and Cassandra is an intriguing portrait of bitter, regretful old age and bone-deep malevolence. . . Rich and lively. Few books can be called both delightful and eerie - this novel is one. Utterly transporting. Settle down; prepare for mesmerism: Laura Amy Schlitz is behind the curtain, ready to show us a story that has real magic lacing through it. Thrilling and masterful. The characters are real humans, trapped upon the page as if by magic. The plotting is relentless . . . and then resolves into a perfect crystal. The book is beautiful. You will bark with laughter and you will cry. I did. A wonderfully twisty, creepy melodrama with three heroes to love, two villains to hate, and then at the end — but I won't tell, except to say it's totally satisfying. A pageturner to be reckoned with for years to come. Give SPLENDORS AND GLOOMS to…kids who want a terrific, meaty mystery. A hauntingly claustrophobic tale set in an 1860 London enveloped in thick fog and a dilapidated estate in England's lake district.... Like a master puppeteer, Schlitz manipulates her characters with agility and skill to a thrilling climax. A real delight... If you’re looking for something dark and mysterious but with a good strong heart, this is the book for you. [A] superb gothic novel…Vivid and strange, this latest work by Ms. Schlitz—a Newbery Medal-winner—is, like a marionette show that the orphans see one night, a spectacle “sharp-edged, exquisite, and eerily alive." This thrilling Dickensian novel weaves a tale of sorcery and magic that will mesmerize with its intricate plot and wicked but endearing characters. As the author unravels the mystery, she explores the many levels on which the characters themselves serve as puppets. Schlitz proves herself a master storyteller as she skillfully maneuvers the strings of this gothic tale right up to the astonishing climax. This glorious novel by Schlitz, a past Newbery Award winner, is filled with lush language and Victorian atmosphere. 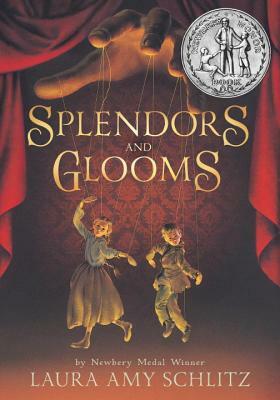 Besides the rich language, setting and plot, SPLENDORS AND GLOOMS features an utterly delicious story that weaves its spell through the fortunes of innocent and not-so-innocent children, the cadaverous puppet master, a dying witch eager for revenge and dramatic action in a castle tower that will have readers as entranced as Grisini’s audiences. This delightfully enchanting book is perfect for nestling in to a comfortable chair with now that the days grow shorter and temperatures dip. It is exceedingly rare to find an author who hits it out of the park, so to speak, every single time she writes. Ms. Schlitz has written six published works for children and not one has been anything but remarkable. As adept at fairy stories as fairytales, at straight biographies or melodramatic ghost stories, at long last we see what she can do with a Dickensian setting. Result: She does wonders. Wonders and splendors with just a hint of gloom. The sole downside is sitting and waiting for her next book. If it’s half as good as this one, it’ll be worth the wait. What more can a reader ask? . . . dazzling . . . a brilliant story well told. The book builds slowly and ends stunningly.